On Wednesday 10th October the edited book ‘Asylum Determination in Europe: Ethnographic Perspectives’ will be officially launched at the Institute for Advanced Legal Studies, London, 3:30 – 5:30pm. Both editors, Nick Gill and Tony Good will attend the event – organised by Professor Dave Cohen and Palgrave Macmillan with Professor Linda Mulcahy (LSE) as the Discussant. Abstract. 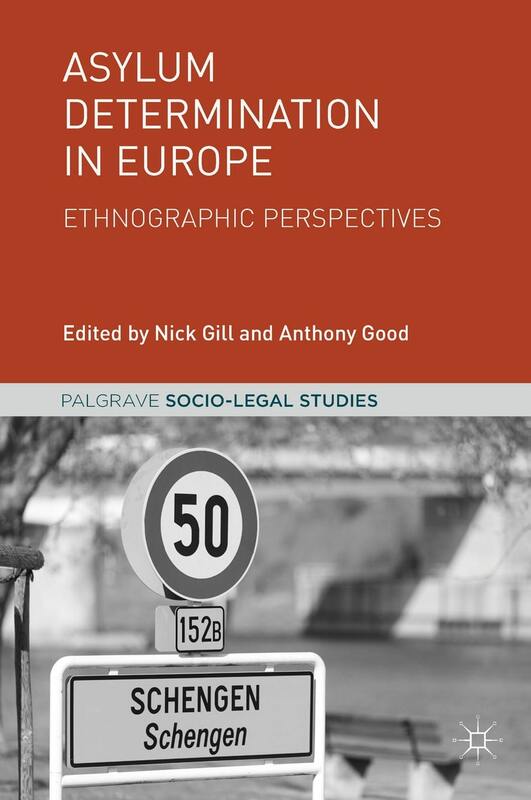 Drawing on new research material from ten European countries, Asylum Determination in Europe: Ethnographic Perspectives brings together a range of detailed accounts of the legal and bureaucratic processes by which asylum claims are decided. The book includes a legal overview of European asylum determination procedures, followed by sections on the diverse actors involved, the means by which they communicate, and the ways in which they make life and death decisions on a daily basis. It offers a contextually rich account that moves beyond doctrinal law to uncover the gaps and variances between formal policy and legislation, and law as actually practiced. More information about the book and its contributing authors can be found here.